In this issue, Alfred tells us about the sacrifices he’s made, the relationships he’s lost, and enemies he’s faced. Alfred rejects Briar’s call to be his pupil, rejecting the ideology that attachment to a loved one is a weakness. Briar torments Batman with the idea that he knows Batman’s secrets because he trained Alfred, Batman’s teacher. The story culminates with Alfred’s show of compassion for Bruce Wayne as they embrace and cement Alfred’s greatest achievement: fatherhood. The story begins with Batman held hostage by Briar in his plane. Alfred’s introduction engages the reader, “Always be yourself unless you can be Batman in which case anything goes.” Alfred then illustrates this idea by going after Briar. Alfred shows reckless abandon as he flies his plane near Briar’s. As a reader we are hopeful that Alfred can rescue Batman but also alarmed by the danger Briar presents to him and Batman. The story transitions between the past and the present with the theme of fatherhood connecting the storylines. For example, Briar condemns Alfred’s fatherly love for Batman in the present. And, Alfred recalls Briar’s callous choice to kill Alfred’s father, when Briar was his mentor. Briar tells that he did Alfred a favor by removing Alfred’s closest attachment and the one who could have made him weak. The no attachments mantra is not original; however, it adds depth to Alfred’s character knowing that he lost his father at the hands of his mentor years ago. The story progresses to a remote island where Briar’s plane crashes leaving Batman wounded. Briar introduces his new pupil as a clone developed by Briar through the use of Alfred’s DNA. This pupil lacks the sentimental weaknesses of Alfred, Briar suggests. The irony of Briar’s belief is made clear to the reader as the story progresses. The clone, which resembles Alfred, gets the better of both Alfred and Batman. Batman begs the clone to spare them and appeals to the clone’s shared DNA with Alfred. 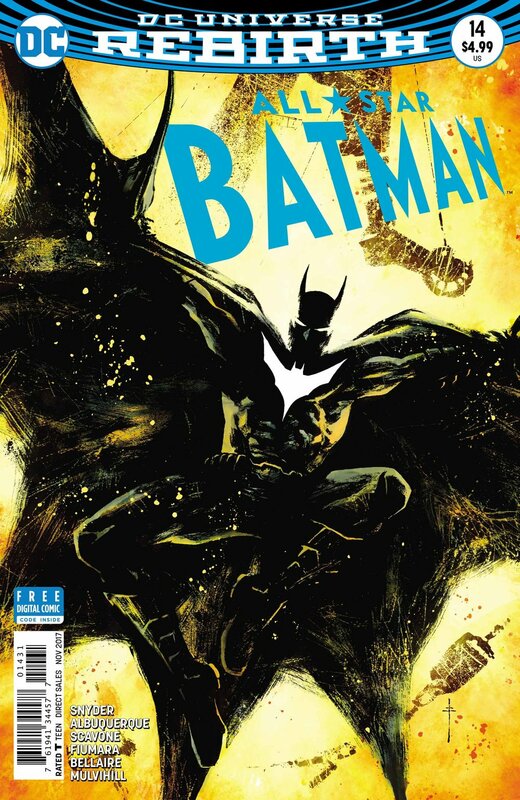 Batman has never begged for his life previously, which bolsters the reader’s opinion of Briar and his pupil both trained killers. The father-son bond runs thicker than tyrannical ideologies. Inexplicably, the clone turns on Briar and kills him. The sudden change in position by the clone resonates as authentic because it reveals Briar’s blind spot. Briar believes that attachment is a sign of weakness; however, the clone’s attachment to Alfred saved Batman’s life. The clone says he’s nothing like Alfred, but that he resembles Alfred in every way screams denial. Additionally, the clone demonstrates one of Alfred’s strongest characteristics, a willingness to act compassionately towards a helpless victim. The story makes one final transition to Alfred, an old man, by a fireplace reminiscing on his life’s adventures. His father was absent from his life, which made it difficult for him to feel close to him . Alfred surmises that his own father’s absence allowed him to have compassion for Bruce and to be the father Bruce needed. The story transitions back to the present; Alfred and Batman embrace. Alfred asks, “Have I been a good father?” He wonders whether he has made a life for Bruce where he can be the hero, be adventurous, learn tough lessons, and always have a home to come back to. The questions resonate for the reader given the context of self-sacrifice and loyalty demonstrated by Alfred. From a father’s perspective, “Have I done enough” is a question most loving fathers ask themselves when thinking about their children.